“I need to talk to you about failure.” So says my dad to me, super casually, while I’m mid-bite of my kale salad. But it’s not the talk you’d expect. He wants to know that, if I’m miserable and not at all getting out of the experience what I want, I’ll be open to quitting. I know. The failure rate is high. I’ve heard an array of stats with the most promising being that 25% of people complete the trail. Given those stats, not to mention normal parenting behavior of encouraging your child to succeed, perhaps it seems a bit odd that my dad has made me promise to consider the idea of quitting. But I’m stubborn. Really, supremely stubborn. Generally regarded as a bad trait, it’s actually one of the things I love about myself. My stubbornness also leads to being loyal and never giving up on people. And stubborn means being determined. Too determined to quit. Circling back to my dad making me promise to quit. It’s backward but I’m flattered. He’s so certain that I’ll do it that his biggest worry is that my stubbornness will keep me from quitting if I’m unhappy. I’ll be OK. I was almost too scared to take on the challenge to begin with. But here I am, about to start, and that is mine. What? No. I want to say to every single one of those people, “You are amazing.” As far as I’m concerned, every single person that steps onto the AT with the intent to thru-hike is a winner, regardless of if they go 2,200 miles or 20 miles. There’s a zillion cliché failure quotes out there that say you only fail if you don’t try. But seriously, they’re actually true. How many people dream of doing a thru-hike that don’t even try? There’s so much talk about failing at it, I think it’s talking people out of doing it. So what, you only get through 400 miles? You just experienced 400 more awesome AT miles than you did before. I’ve read some amazing “failure” stories from people that gained so much out of half of the trail that it’s a shame to call them failures. 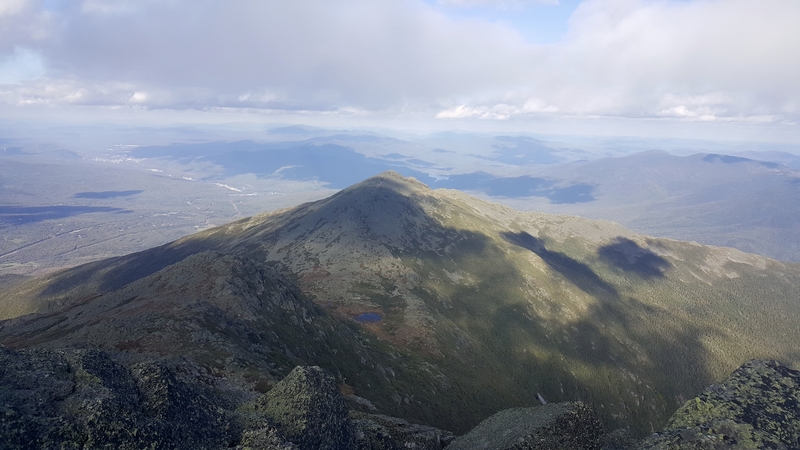 In Larry Luxenberg’s Walking the Appalachian Trail, one hiker’s opinion is that NOBO thru-hikers should hike to the campground in Baxter State Park and stop there. Not actually summit Katahdin. The idea is that thru-hikers get so focused on the end, or completing it, that, by skipping Katahdin, it shows that it really was about the experience, not the finish line. View from Mount Adams. I had a horrible time the first time I hiked Adams, nearly crying by the top. I chalked it up to a bad day and went back to redo it a couple of weeks later. Worth it! I don’t want to be misunderstood in my desire to complete the trail. I don’t have a “so what” attitude about finishing; I very much want to finish and am taking this very seriously. I’ve learned from past backpacking trips that, no matter how challenging they get, it always pays off. I’ve also felt the disappointment of not completing a trek that I planned to. I just wish there wasn’t such a bad stigma attached to not finishing. I know what I’m taking on is going to be incredibly hard, both physically and mentally, and I don’t want anything to get in the way of getting everything I can out of it, and that includes disappointment in not finishing. I think that if I hiked from Georgia back home to Connecticut and stopped there, I’d have every right to be pretty damn proud. And I think it’s important that, if you decide to quit, don’t quit too soon. Know that it’s not a fleeting frustration but truly the best choice for yourself. Because as awesome as it is to attempt the goal, I suspect achieving the goal is even greater. So I’m going to finish (dad thinks so too). And as for skipping Katahdin? Sorry Larry, but no way! It’s a cliche, but it’s true: Don’t quit on a bad day. Also, in my experience, don’t quit at the end of the day. Sleep on it and see how you feel in the morning. Remember, you can always give yourself a break — a couple of days, a week, even a month — and come back to finish. Finally, I learned the hard way (even though I finished) that the mental and physical toll of the trail is *cumulative*. Just because you *can* knock out 160-mile weeks in Virginia doesn’t mean you should. My body and mind were exhausted when I hit Vermont. I took a break, flipped to Katahdin, and finished SOBO in a blaze of glory. Prejudging an as yet not begun long-distance hike, or thru-hike, as an event which could be a “failure” is the greater overlooked failure here. It also sheds light into the narrow binary recesses of the would-be thru-hiker’s mind. Imagine a 6 month mountain top sojourn with new soon to be lifelong friends on America’s pastoral and idyllic Appalachian spine crossing four seasons and 13 of the 14 AT states and, for whatever reason of a potential myriad of reasons, stopping at the Maine border to return home look back and conclude: “I have failed!” Certainly if you can cast aside a single day you had the great privilege of walking along the AT as part of an epic fail you have indeed failed. Failed to see the simple elegant subtle truths enjoyed by true outdoors people who enjoy spiritual enlightenment through a relationship with the wilderness or backcountry: having once been there is to have truly “made it all the way”. Absolutely love your writing! I feel like we just had a conversation rather than me having read your post. I admire your determination/stubbornness and know that you’ll make it anywhere you wish. Good luck! And can’t wait for your updates!